These take just a few minutes to make and are delicious served warm just as your guests arrive. 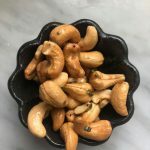 You can use a combination of mixed nuts or all cashews. Place the nuts on a baking sheet and bake in a 375º oven for 10 minutes. Mix together the rosemary, cayenne, dark brown sugar, sea salt and melted butter. Mix the warm nuts in the spice mixture and toss together to coat.